For The Cure - Jill Ruth & Co. This book is on my wish list. Aren't those charms beautiful? You can read all about it at Ruth Rae's blog here. 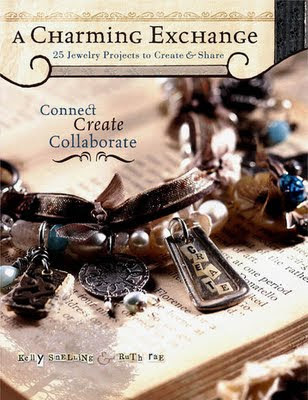 But, what my post is really about is that there have been necklaces and bracelets donated to be sold on Ebay from this book. 100% of proceeds goes to Susan G. Koman for The Cure. You can check them out and bid here. The beautiful bracelet from the cover of the book is in this lot. My Mom has had a mastectomy and one of my cousin's wife (my age) just had a partial one, and my BIL's sisters & Mom, and.....the list goes on and I know all of you know someone also. Just thought some of you may enjoy these pieces and might want to go bump up the bids. Cancer is such an ugly thing - I am so happy to know you have so many survivors surrounding you!!! I'm definitely going to have to go raid ebay and see what I see - that book looks soooooooooo fun!! !